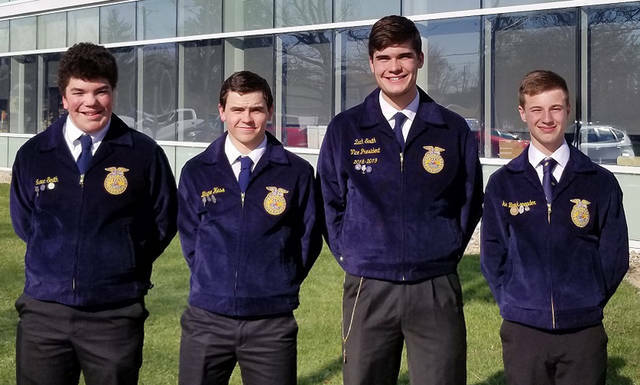 Members of the Arcanum MVCTC FFA grain merchandising team who competed in the state finals were (l-r) Isaac Smith, Blayne Hess, Zach Smith and Luke Brinksneader. ARCANUM – Arcanum MVCTC FFA members recently competed in the Ohio FFA Grain Merchandising Contest. The purpose of the Grain Merchandising Contest is to stimulate interest in the area of grain merchandising and to make students aware of the complex decision-making process associated with merchandising agricultural products. Arcanum MVCTC FFA members Isaac Smith, Blayne Hess, Zach Smith, Luke Brinksneader, Landon Haney, Anna Loxley, Kaylee Wilcox and Austin Stephens completed the online test portion of the contest on Feb. 26. During the online test, students were given 50 general knowledge questions about grain merchandising and five problem-solving questions. The questions included puts, calls, basis and hedging. The team finished in the top 10 in the state and qualified for the state finals on April 2. Isaac Smith, Hess, Zach Smith and Brinksneader traveled to Wilmington College where the completed a scenario that consisted of the students assuming the role of a grain producer and were given information to develop a marketing plan for the farm. They were given 20 minutes to prepare, 10 minutes to present and five minutes for questions from the judges. At the end of the contest, the team from Arcanum was third in the state. The team members were coached by Janelle Brinksneader and received support from The Andersons Marathon Ethanol.